Big news! I Can Handle Him is going on summer tour and you are invited to come along! Over a dozen bloggers have signed up to review the book, host a giveaway or post an interview with me during the blog tour. If you've read I Can Handle Him, you might enjoy reading these bloggers take on the journey of Quinn, Tory and Nick. If you haven't read the book, then these reviews might encourage you to read it! I will be posting the reviews on this site, as well as to my Twitter and Facebook pages. You can see the full list of who is participating here. It's going to be a fun July! Booklist Magazine, published by the American Library Association, is the premier review publication of new books. Thousands of authors and their agents try to get their books listed each month. And this month, I CAN HANDLE HIM got in! Are You Up For Danger? 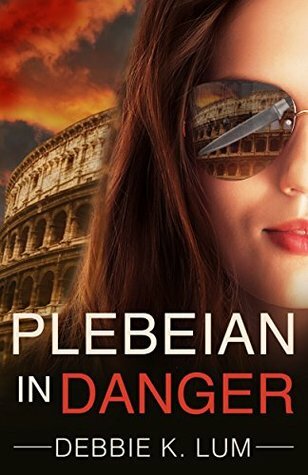 How about a free copy of PLEBEIAN IN DANGER! Even though I'm madly promoting my new book I CAN HANDLE HIM, I had to throw in some dangerous fun for summer. I'm running a Goodreads giveaway for PLEBEIAN IN DANGER. Hurry! Ends June 25! Giveaway ends June 25, 2018. The June issue of Kirkus Reviews Magazine features a review of I Can Handle Him! Out of all genres, it's one of 35 Indie reviews that they selected for this issue. Read the full review here. It's National Best Friends Day! Would you give your best friend your concert ticket to the hottest show? Or fix a problem that she helped cause? Or step aside so she could find romance with the guy that you secretly like? That's the type of friendship that I love. And that's the type of friendship Quinn and Tory have in I Can Handle Him. That's I CAN HANDLE HIM in the New Title Showcase at the country's largest book expo in New York City!